My wife bought the Creative Zen Neeon 2 (2GB) on Saturday for a mere $99 (AUD) from MYER. Shopbot and MyShopping were listing the same player from $179 to $226 at various online retailers so it all seems like a great deal from a big department store! 2GB is by no means huge but for the price you can't go wrong. The sound quality on this device using the supplied earbuds is quite good with a nice range. We had the bass boost turned on initially and had to turn it off because some songs were distorting slightly. Bass response was still great. The user interface isn't bad once you get used to it (my wife isn't a technophile and she cottoned on in no time) and the thumb wheel works quite well. I don't have huge hands but my hand did start getting tired after playing with the thing for a while. The unit has volume controls and a record button one side and a play/pause/power button on the other side with the thumb wheel. Neither of us have used the iPod wheel before so I guess we don't know what we're missing out on--and don't care! 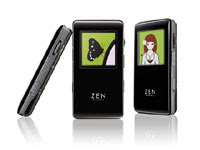 The Zen plays MP3, WMA, and WAV formats. It also plays video but the video has to be transcoded using the supplied software. Images are viewable as JPGs. The radio reception was a little iffy and was coming in quite fuzzy while the FM radio on my mobile phone had crystal clear reception right beside the Zen. I haven't tried the line-in function yet. The display was nice and bright and the shiny black surface of the case didn't show too many fingerprints. Without installing the software suite, we connected up to a USB 2.0 port off a Windows XP computer and were able to start copying files immediately. Transfer time wasn't exactly fast but nothing to complain about. The internal folder structure on the device is extremely logical and you could probably copy other files onto the player for moving to and fro. We also connected the device to a Windows Vista computer using slower USB 1.0 ports but the player wasn't recognised and we didn't persevere. The unit came with earbuds, a USB cable, a line-in cable (1/8"), a lanyard, a DVD with a user manual and software, a printed user manual, and some stickers. The battery is built-in and presumably not user-serviceable. I'm pretty sure this thing has a 1-year warranty. I don't think I'd pay full-price for a player of this size but at $99 the iPod and variants don't really compare. After experiencing intermittent network issues with his VPC, one of my work colleagues was forced to contact our helpdesk extraordinaire to resolve the issue. We use a base VPC (.vmc + .vhd) as the foundation for our individual developer environments and the problem was traced back to the same MAC address being used by multiple VPCs. By repeatedly copying the same .vmc file, a number of us ended up with VPCs sharing a common MAC address. A MAC address uniquely identifies a NIC at the hardware level (right down at the bottom of the network stack) and is set in the factory. The VPC world in which we live, however, means we're no longer dealing with physical hardware all the time and, as you probably know, multiple software NICs can be added to a VPC quite easily. As a result, Microsoft Virtual PC generates a new MAC address whenever a new VPC is created and a software NIC is assigned. A VPC's MAC address is stored in the .vmc file, which is actually a valid XML file (open the file in Notepad or an XML editor). Once generated, the VPC's MAC address is stored in an element called "ethernet_card_address" and stays that way until it's either manually changed or the .vmc file is replaced. Until we encountered this issue, we were saving both the .vmc and .vhd files as part of our development environment "base image"; had we stored only the .vhd file(s), we'd be forced to create a new .vmc file when creating a new environment. Creating a new .vmc file is a simple task and doing so would have avoided the problem encountered by my colleague. The alternative to deleting the .vmc file is to simply delete the value contained in the ethernet_card_address element of the .vmc file. Virtual PC will generate a new MAC address the next time the VPC is started. It should be noted that while our individual VPCs now employ NICs with unique MAC addresses, the base machine was part of a workgroup and was therefore not sysprep'd. We join our VPCs to our dev domain after copying the base image.